Chad Higgins, a professor at Oregon State University's Biological and Environmental Engineering program, is conducting experiments to improve hazelnut irrigation techniques. Soil sensors in the ground, evaporation sensors in the air and sensors in the tree will measure water circulating through the orchard. Evaporation sensors measure the amount of moisture in the air rising from the soil and the hazelnut trees. The data will be used to help growers decide how much water new cultivars need to thrive. Chad Higgins, an Oregon State University agricultural engineering professor, stands beneath a 30-foot steel tower in the middle of a hazelnut orchard a few miles southwest of Amity, and points up to a jaw-like contraption that looks like it should adorn the side of a spaceship. These sensors, he says, will measure water that evaporates from the ground and the trees into the air from a 15-acre portion of the orchard. At the base of the tower, wires snake into the dirt, measuring soil moisture. In a few weeks, young tree trunks will be pierced with sap sensors, measuring the moisture moving through the trees. Higgins and his students are collecting the data to see what the hazelnut trees are doing in real time, hoping to establish guidelines that new hazelnut growers can use to plan the most efficient irrigation schedules in the Willamette Valley. 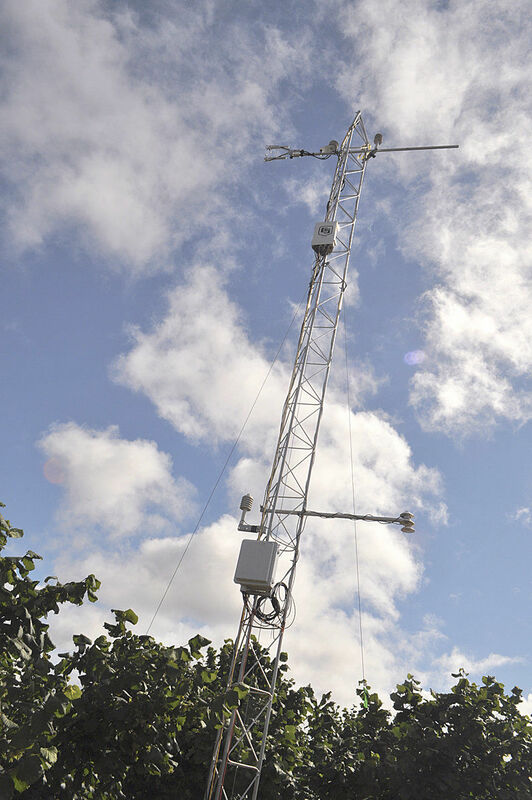 The guidelines for most crops are created by gathering information from sensors or historical records. Most of that data is publicly available online at AgriMet, a program of the U.S. Bureau of Reclamation that, among other things, lists recommended watering schedules in charts specific to crops. Missing from those charts, though, is the data for the latest hazelnut cultivars, recently developed to replace trees susceptible to the Eastern Filbert Blight. The blight in the Northwest, and in other parts of the world, has devastated hazelnut crops. Added to the blight’s damage, world trade and distribution unrest has disrupted international hazelnut growers, who once produced more than 90 percent of the world’s crop. The world market’s loss has been a boon to Oregon growers who have expanded acreage from about 30,000 in 2014 to nearly 70,000 last year, according to Polly Owen of Oregon Hazelnut, a nonprofit branch of the Nut Growers Society. “I see the change in the valley and it’s exciting, but there needs to be an equal amount of information to support it,” Higgins said. Higgins hopes to help growers who are planting the resistant cultivars, especially the Jefferson hazelnut, by setting irrigation guidelines that fit the new types of disease-resistant hazelnuts — guidelines that now do not exist. To that end, he has established a research station in a 100-acre orchard a few miles southwest of Amity, where he is gathering data that may set optimum irrigation standards for the new cultivars. Despite lack of specific funding, Higgins has pieced together equipment used in similar OSU research on other crops, to gather data on hazelnut irrigation. Higgins chose this particular field for its location in Yamhill County, its healthy Jefferson cultivars, and its owner’s dedication to innovations. The trees here are young, blight-free, and productive, Higgins said. The owner is trying various drip irrigation methods, including some double lines, to see if extra water increases yield. The owner is experimenting with denser plantings, with plans to remove extra trees this fall. Small solar panels send power to the instruments. Higgins’ sensors are taking 20 measurements of nine variables every second. By December, the information will be assembled and analyzed. If all goes well, his findings, in the form of irrigation recommendations, will be available online by the start of irrigation season in 2019. For more information about other water resource research at OSU, visit the webpage at https://bee.oregonstate.edu/.